St. Petersburg’s Polkovo Airport (code: LED) was something of a black box until very recently. It’s not what you’d call a high-traffic airport for most US and Western Europe based travelers, and what little information one could find about it online wasn’t very promising. There were tales, for example, of arcane boarding procedures and outdated lounge amenities. There was little info at all about the Pulkovo business class lounge. Fortunately, a funny thing happens when a country hosts the World Cup: everything gets an upgrade. Airports, metro stations, hotels, whole sectors of infrastructure get renovated in order to put the host country in the best light possible for the hoards of inbound tourists. Whether or not this is a positive phenomenon for the country’s economy is a topic of hot debate. 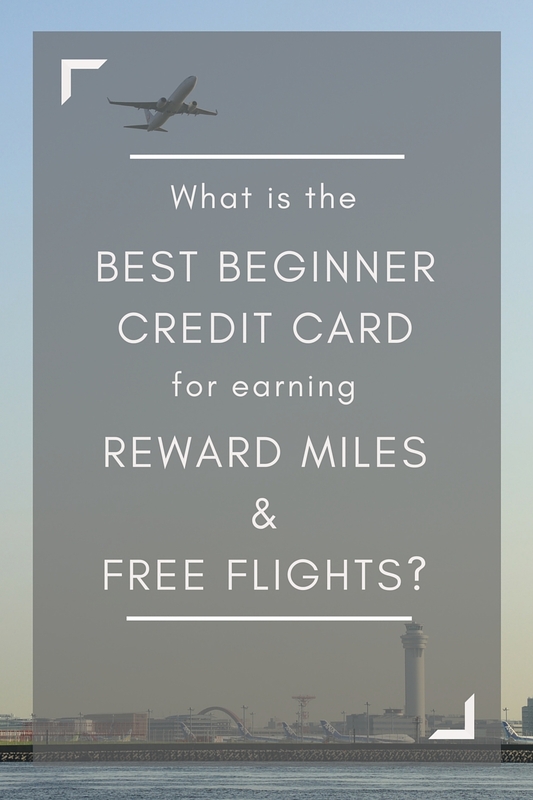 But for travelers seeking airport amenities, it’s usually a win. Pulkovo got a big upgrade between 2016 and 2017, and it shows in almost all aspects of the travel experience. 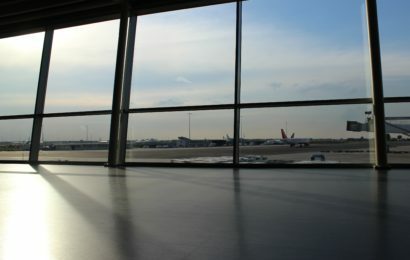 However, the business class lounge available to travelers from on carriers like Turkish Airlines, Lufthansa, British Airways, or pretty much any non-Aeroflot line, is still sorely lacking. Read on to find out why. Whatever weird boarding and flight check-in procedures Pulkovo may have enforced prior to the World Cup are gone, and the people flow is now more or less what you’d expect from any international airport. Additionally, the entire airport has gotten a massive facelift and bears little resemblance to the few photos I’ve been able to track down from it’s pre-2017 days. The boarding area below the lounge – you might as well just skip the lounge and hang here before your flight. 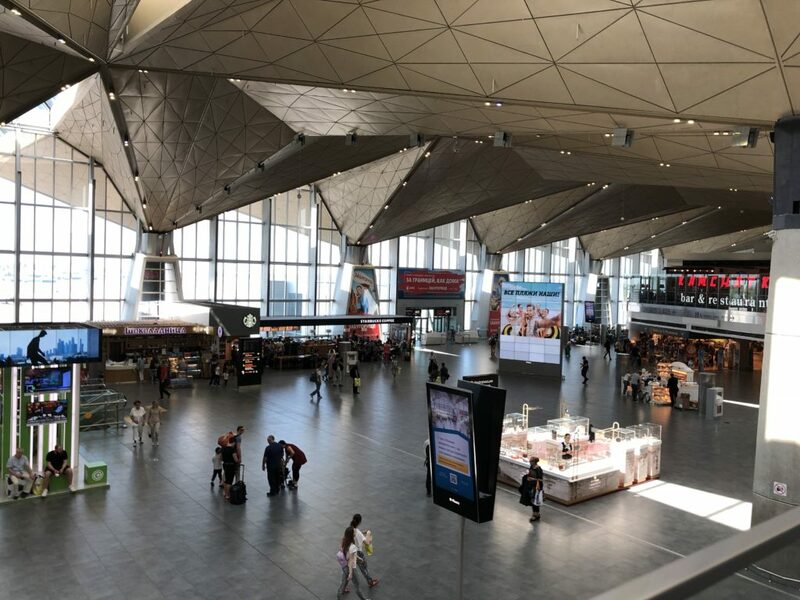 Nowadays, Pulkovo International Airport is sleek, modern, and well-appointed as far as basic restaurants and bathroom facilities go. The departure terminal is shiny and modern, and boasts a suite of restaurants and fast dining options. The boarding areas are big and bright. 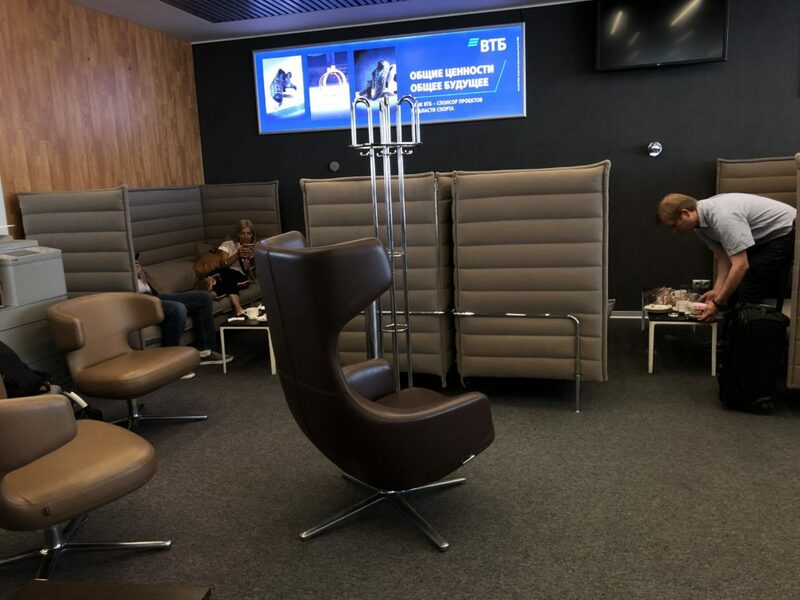 However, the business class lounge in Pulkovo’s Terminal 1, which is the main international departures terminal, is far too small for the volume of passengers it attracts. 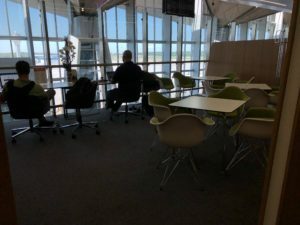 The main issue with the LED business class lounge is that it services customers from nearly every airline that the airport hosts, except for Aeroflot (which has it’s own blissfully separate lounge just across the walkway). 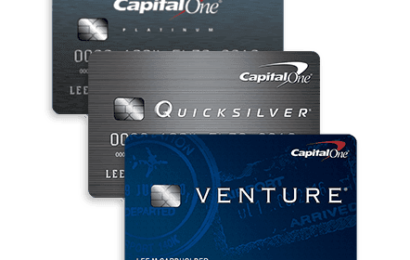 That means that passengers from business class flights on over a dozen airlines, plus anyone who buys a pass for the day, can gain entry into the lounge. The lounge just isn’t built for that kind of volume. It’s located on a second floor catwalk, overlooking the main terminal. You have to take an escalator up to the catwalk, then walk through the restaurant row (with a TGI Fridays, Burger King, and Il Patio among other options). 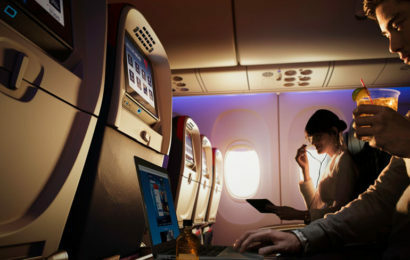 Upon entering, you’ll see the check-in desk on your left and the main seating are to your right. The walkway then snakes around to the left, leading to the rear of the lounge where the busineess outcove and bathrooms live. 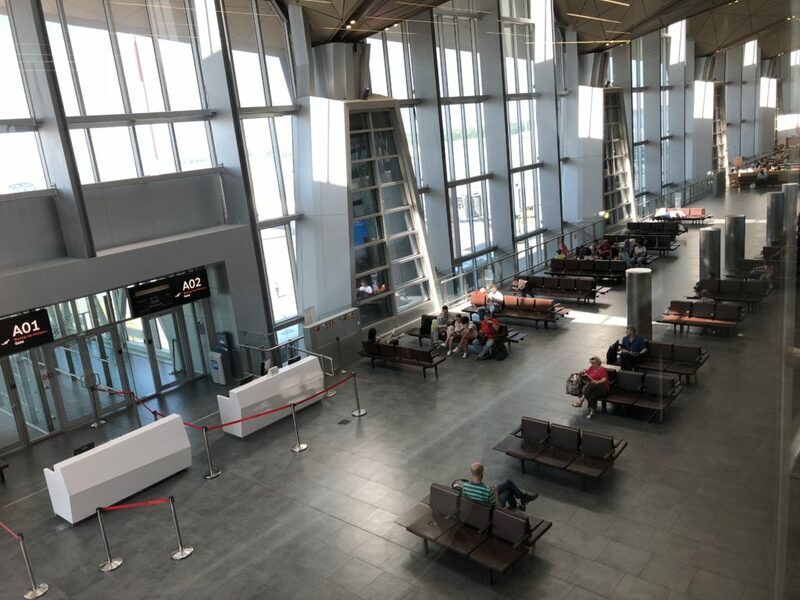 The entire lounge is barely a proper “lounge” – it’s more of a section of the catwalk that Pulkovo has cordoned off with some glass panels from the rest of the restaurant area. It gives the lounge a frantic kind of feel, and fails to establish that level of elevation above the fray of the rest of the airport that so many other lounges pride themselves on. Just look at this crowd. The result is a cramped lounge with about a third of the seating that it really needs. When I got to the lounge, there were barely any seats left in the main seating area or the food table area. There were some nooks in the business center with desks and computer workstations that were available, and couple tables in the absolute rear of the lounge. Everything else was full. There were bags and people sitting on the floor. It was a regular pedestrian terminal experience, stuffed into a business lounge wrapper. The slim options available in the food area had long been picked clean. 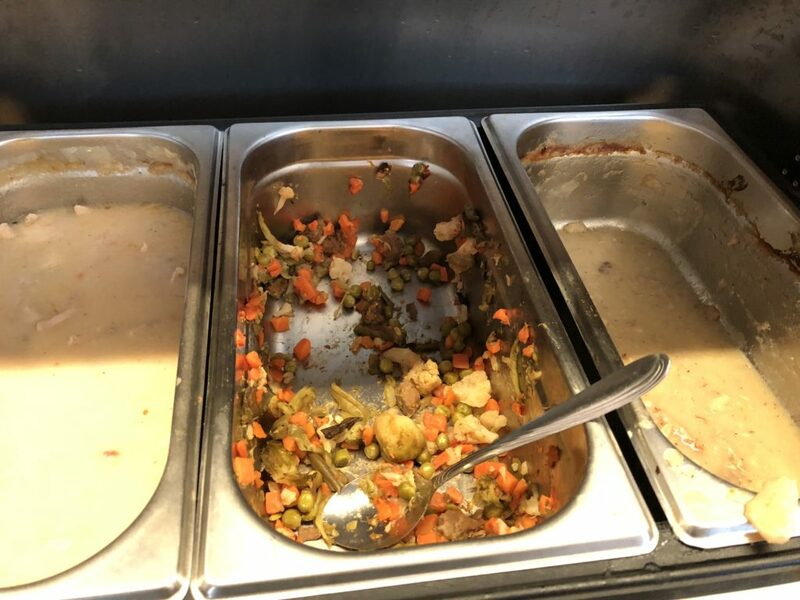 There were three small tins of warm food options: two chicken dishes and a beef dish. The labels were only in Cyrillic and sloppily hand written, so I couldn’t have deciphered them even using Google Translate and some elbow grease. 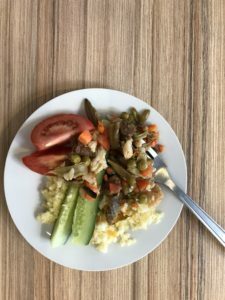 That left the vegetables: some sliced tomatoes, some sliced cucumbers, and a bowl of couscous. That’s it. What’s worse, I stuck around for about an hour to see if someone would come replenish the food, providing Pulkovo the benefit of the doubt that maybe I had just arrived at the transition time for the kitchen. No such luck. The chaffing dishes stayed empty the whole time. After the food proved to be a bust, I made a beeline for the bathroom (not that I had to travel far in such a cramped space). There was a line for the men’s room about four people deep, and it held steady at that number for pretty much the whole hour I was in the lounge. Maybe I’ve been spoiled until now, but I’ve never seen that long of a line in a business class lounge. 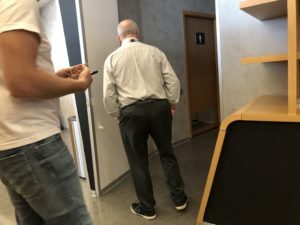 And the gleaming irony of the whole scenario was that, not more than 40 feet away through the glass partition was the public restroom, with rows and rows of available stalls. The line for the bathroom. The women’s restroom didn’t look like it was faring much better. With nowhere to sit, no food available, and not even a place to find some *ahem* relief, I called it quits and retreated to the relative sanctuary of the public restaurants. 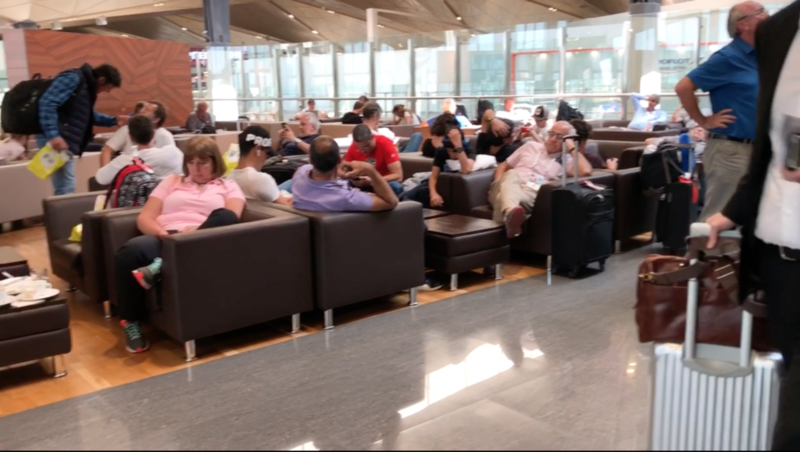 It’s not the first time that I’ve observed a “reverse lounging” effect whereby the lounge becomes so crowded before a big international flight that the most enjoyable space is actually a non-lounge corner of the terminal. But the strange thing is, the overcrowding at the Pulkovo business class lounge didn’t seem to be a cyclical phenomenon. The crowd held steady throughout the morning, and even got worse as the day ticked on. Unless you have Aeroflot status – which I can’t imagine any non-Russian citizens do, it’s the business lounge or bust for your trip to Pulkovo. But there just doesn’t seem to be any real advantage to actually going to the lounge in light of all the things it gets wrong. It’s a disappointing chapter in the story of an otherwise modern and pleasant airport in St. Petersburg, Russia.